You know that trick of sprinkling water on a stale baguette to revive it? Forget it. I have something even better. Use a day old baguette to make Sea Salt Olive Oil Toast. 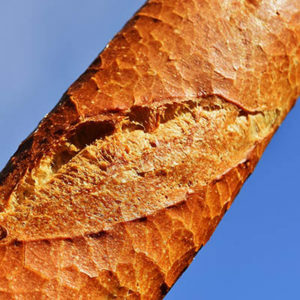 Slice the baguette, brush the slices on both sides with olive oil, a light sprinkle of sea salt, and fry both sides in a dry skillet until golden. Great with salad, soup, eggs, steak, or as a midnight snack. This simple toast is great with anything.